Sabeen Mahmud assassinated: A devastating blow against freedom of thought – The brain is sooooo cool! 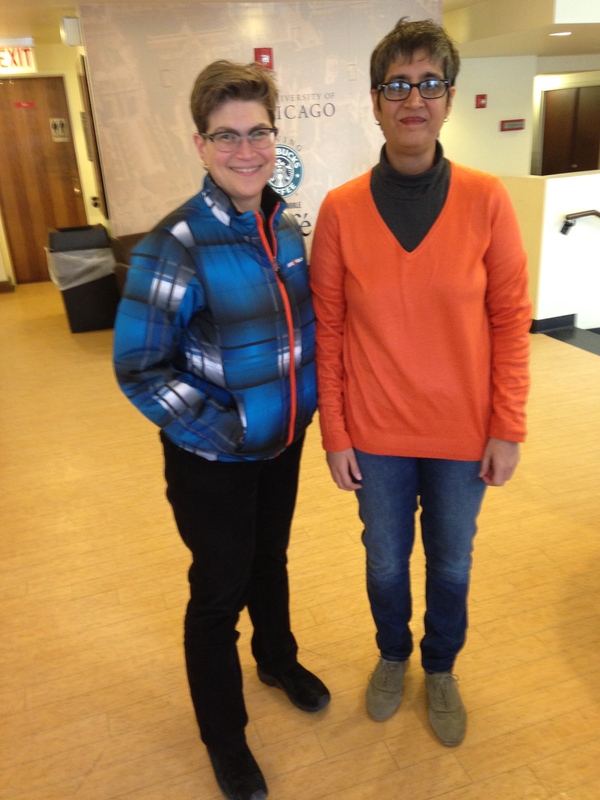 Sabeen Mahmud and I at the University of Chicago bookstore on February 24, 2015. I was devastated when my friend and colleague, Sheharyar Hasnain, emailed me to tell me that Sabeen Mahmud had been assassinated in Karachi as she and her mother were going home from her bookstore/café/salon. As of the latest updates, Sabeen’s mother is in critical condition. I am an unlikely person – an Americam Jew – to be touched personally by the targeted killing of a social activist in Pakistan, a predominantly Muslim country. And yet I am, and deeply so. 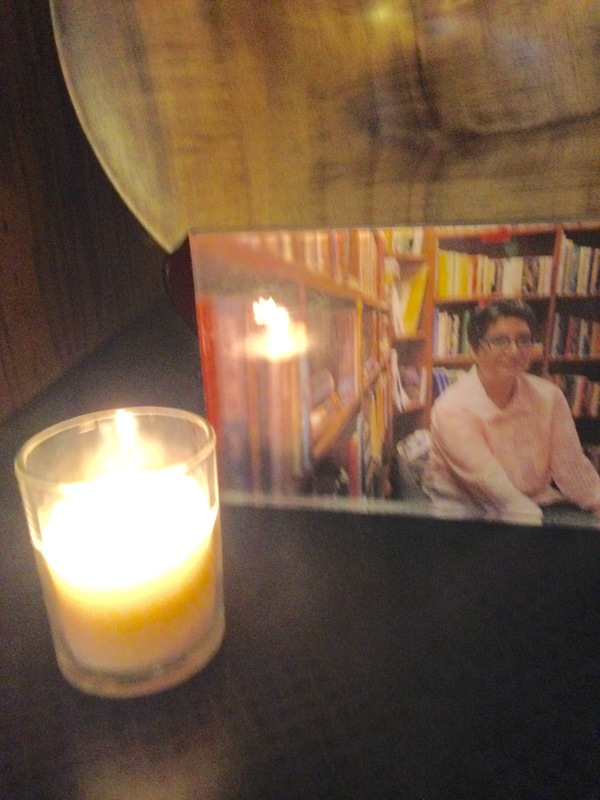 A yarzheit candle lit in mourning for Sabeen Mahmud. The picture that Sabeen used on her Twitter account. 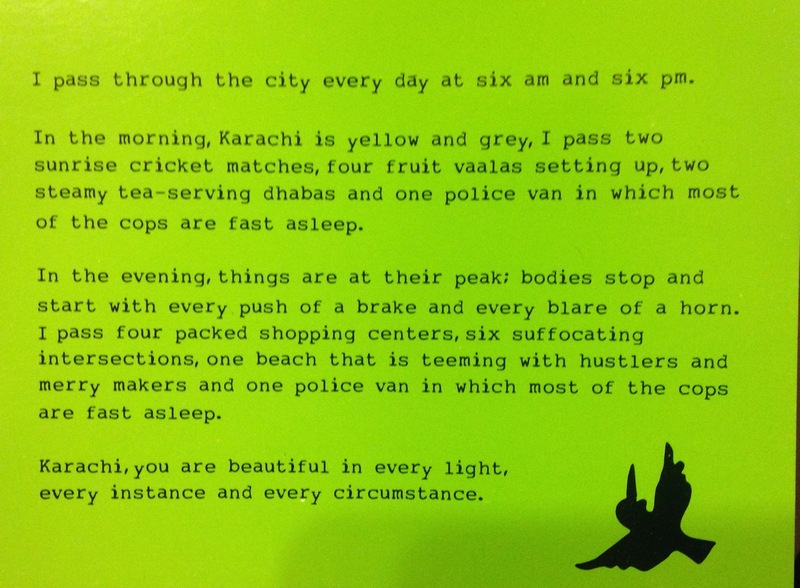 This is from a booklet on the T2F coffeehouse, aka the PeaceNiche,that Sabeen started and ran in Karachi. Look at the pictures on the left and you can see how warm, inviting, and artistic Sabeen’s café is. I was amazed that such an oasis of art and free thought, more reminiscent of Paris or New York, existed and thrived in Karachi. 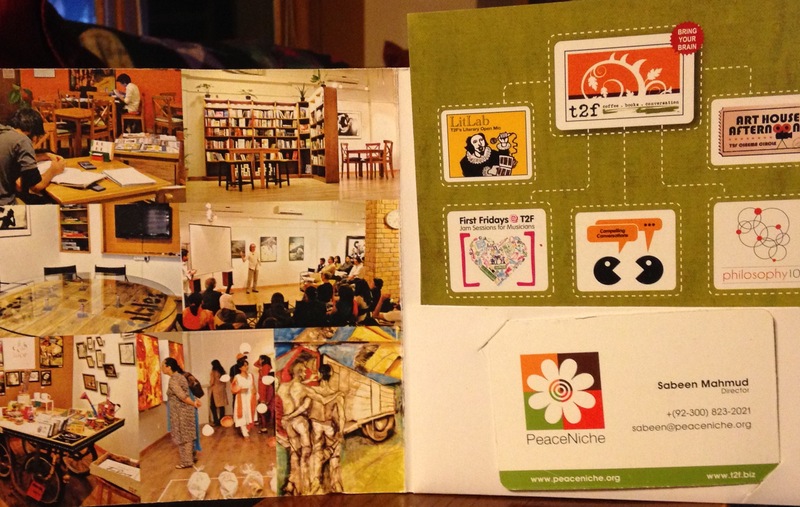 The coffeehouse that Sabeen created in Karachi, named T2F, provides “a platform for people to engage with each other. A community space for open dialogue… hosts readings, meetups with writers, talks, debates, theatre performances, film screenings, open mic nights, jam sessions, and standup comedy.” As Sabeen told me about the coffeehouse and I looked at the pictures, I wanted to go there and experience the intellectual and artistic vibrancy first hand, Karachi style. Meeting Sabeen was fun. She was easy to talk with and hugely interesting, a person who I’d be friends with given the right circumstances. Sabeen was intrigued by my laboratory’s work on helpful, empathic rats. As it turns out, I was recording a segment for the NPR podcast The Adaptors earlier today, just before I found out of Sabeen’s assassination. For the show, we were talking about an apocalyptic time when climate change has ended humanity’s supremacy, bringing……rats to the fore [I always thought insects would rule when our dominion ran out but the futurists contacted by the show predicted that rats will inherit the earth from us.]. I was asked how a society of rats would behave toward each other. Would the rats of the future be as helpful as our laboratory rats? Would they live in socially cohesive groups, free of the cultural baggage that so many humans use as an excuse for intolerance and hateful violence? I don’t know how the rats of the future will behave but I am more convinced than ever that if humankind wants to avoid its own demise, we need to live up to our name and to our mammalian roots. Sabeen lost her life, gunned down earlier today shortly after hosting a discussion about Balochistan, the largest (in area but not most numerous in population) province in Pakistan which is home to activists who have gone missing and in some cases been killed and their bodies dumped. Sabeen’s final tweet reads, “Unsilencing Balochistan (Take 2) with Wusat Ullah Khan, Mama Qadeer, Farzana Baloch and Mir Mohammad… https://instagram.com/p/13RnOLnFzq/ “. The murderous discomfort with dissent and political opposition is highly reminiscent of this year’s Paris attacks. Today a passionate light in the quest for social and political justice has gone dark. I am devastated by our loss. I am thankful for who Sabeen was and what she did for all of us in her short time with us. A postcard from a collection given to me by Sabeen expresses the hope that exists for Karachi and indeed for all of us. This postcard comes from a collection entitled, “From Karachi with love” that Sabeen gave me. I think the aspirations – “Karachi, you are beautiful” – expressed are those that Sabeen hoped would come to pass for her beloved city. Compassion and altruism, both evidenced in great degree by this outstanding activist, are the two sorts of behaviour which promise most for the survival of the human species. They are both most difficult to show when confronted by violence and philistinism, but in the end they always prove the stronger. I admire her bravery, and doubt whether I would show anything like the same strength as she did. I am not sure if here is the right place to make my suggestions, it feels right, almost in memory of your friend. I also do not want to be swayed by any search for upticks on the course forum. If you are prepared to be really committed, I think that the most incredible option would be an educational virtual cafe based in the cloud. In this cafe there would be selected videos of you, and others if you want, giving lectures on the reason why the evolution of our brains has made empathy and altruism the ‘Natural’ and best route to survival as a species. This “place” would be dedicated to peace. There would be no business model, and no exclusions. No religion and no politics. Everyone in the world would be invited in, preferably without risking giving their URL for those countries where being identified might be deadly. Your MOOCers would form the tiny base of this idea, and it would spread virally outwards from there. Can it change the world? Who knows. It would have a good chance to try. It would become a bit like a different but important version of TED. The issue of security to avoid being infiltrated by the dark side would need some attention. It is a very interesting idea and I like a great deal of it. I like an open forum for learning and teaching but I would center it around neurobiology in general where my strength is. I have only scratched the surface in Coursera on neurobiological topics. One question is whether to go deeper into topics already covered or to survey additional topics. One of the aspects that I love about the MOOC is that people leave their politics and divisive views at the door and focus on neurobiology. I think this is an indirect way to promote peace by connecting people through a shared interest. And while I like an idea of an open forum hosted somewhere on the cloud, the support of the University of Chicago and Coursera should not be under-estimated. In order to make the videos as professional as they are and to have the excellent course interface, both of the above institutions are needed. Coursera is moving to non-cohort classes. What that means is that the class page will stay open indefinitely. People can join in each month. This would allow me to supplement the basic course as much as I wanted to. So this is a very realistic possibility. I welcome your and other’s reactions to these ideas and questions. Having said that, I completely agree that being firmly a neuroscience course does mean that people, except occasional dratted controversialists like me, leave politics and religion behind. Unfortunately, a completely free course, allowing everyone in, would certainly include people that one did not want, but maybe they are the ones that you should be talking to most. I have no ‘skin in the game’ as someone on your course said to me about a final project I proposed. I just recognize that people with your talent and your determination are very thin on the ground, and that so very many people would stop to listen to you. I love the idea that the course page would be open indefinitely. Mike, I like your idea of getting the whole world talking but I think it would be impossible to leave religion and politics out of it. You might find “The evolution of God” by Robert Wright an interesting book. I, like you, have become addicted to Dr. Mason and don’t want to see her go. I agree on the open page. In the British Royal Navy, where wardrooms are not dry, politics, religion and women by name are forbidden topics for discussion. This would not work on an open forum, and the great danger of being infiltrated by really evil people would have to be confronted, but if we are to go forward as a species, some different ways of global communication will have to be confronted. I can easily understand why Peggy would not agree to the confrontational forums that would be inevitable, and I think she is right that keeping to Neuroscience will keep the political and religious elements away. Leave them at the door, as she says. i will read Robert Wright, thank you for the recommendation. Peggy, I apologise (again) for using your sad column as a talking shop. But maybe Sabeen would have approved. I’m so sorry for your loss. It’s hard to lose anyone no matter how close or distant they may have been. Some lives can have a profound effect on us even if their interaction in our lives was limited. This one is definitely one of those. She sounded like quite an amazing person; very humble and promoted such change and community. It’s hard and sad to realize how people can be here one day and gone the next; and to go that way is a difficult pill to swallow for anyone. It’s beautiful how much love she had for her city and and her culture which I’m sure she possessed until that very last moment. At least her death means something, many deaths go unnoticed, hers will mean something and she will be missed by a large network of people who will pass her message along and continue her tradition and legacy. I’m also apart of your Neurobiology MOOC course on Coursera and treasure it so, it is a wonderful experience for me and I am sure it was definitely for Sabeen. I’m deeply sad for the loss of Sabeen Mahmud. My English is not good enough to express myself, sorry. My condolences. I think your words are very clear and very emotionally powerful. Thank you. Prof Peggy, in case you haven’t seen this…. Thanks for sending that link. I received an email that made it clear that the article was out but had not found it yet. I’m glad if it is true that Sabeen died instantly. I hear her mother is doing well. I hope her mother finds courage and strength to forge on without her beloved daughter. 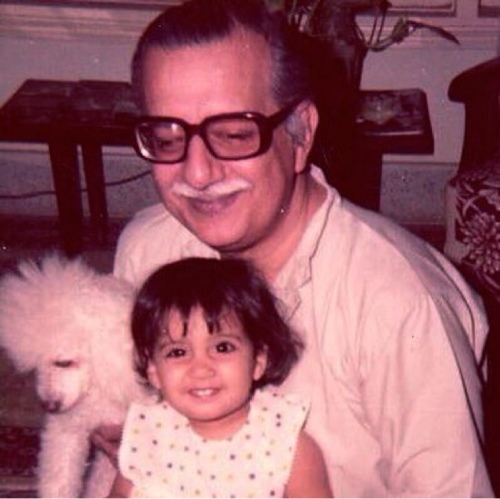 So wrong for all of us to lose Sabeen and so deeply wrong for a parent to lose a child, and what a child. What a child indeed. Thanks for letting us know her mom is doing ok – she will need lots of courage and strength going forward. I am so very sorry that you have lost a friend. It sounds to me like the world has lost a wonderful person. It always saddens me when a life is taken in that manner. Especially when it is a life who is trying to make a difference for the better in the world. I am saddened when I read an article or see a news story showing how our sisters are treated in other countries. My wish is that everyone (especially women and children) have the opportunity to learn and live in peace without the threat of death for wanting to learn or teach. This is a sad moment indeed. Well said, Shery. Thanks for stopping by.